This intriguing piece appears to be a first shot prototype for the Double Telescoping lighsabers that were used on Luke Skywalker, Ben Kenobi and Darth Vader. From what I know approximately 3-4 of these have surfaced as of this writing. These pieces are very crude looking and were likely made in house at Kenner using an aluminum mold of some sort. They do not have the typical break points as they were probably made by hand. 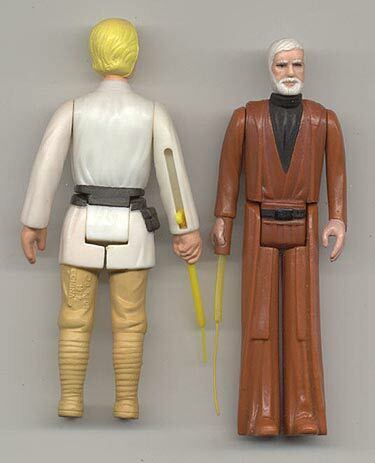 It is likely that yellow was chosen since Luke was one of the first figures being developed, however this could also just be a coincidence or perhaps the light color was easier to work with. The above photo provides a comparison between the prototype DT saber and a production saber. As you can see the prototype saber is much lighter in color and is almost translucnet. 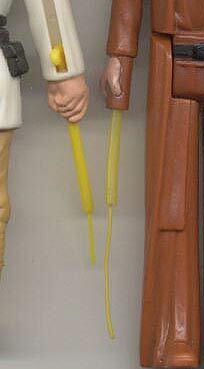 You can also see some excess plastic at the end of the thicker part of the saber. Finally we see a full figure comparison shot. Although the photo doesn't convey it, this Ben figure has "EP" along with the number "A6" marked on the bottom of it's right foot. This indicates the figure was likely an engineering pilot. It exhibits dates and foot holes and seems to be a regular production figure in all other aspects. This is a very interesting stage in the development of the DT saber and only adds to the mystique surrounding them.